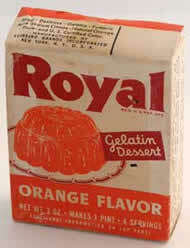 What are the chances that a piece of cardboard, cut from a box of Royal gelatin or pudding has survived in good condition for 60 years? Not very good! Most of the ones you see look like they were cut out by a kid who was scissors-challenged. This is a really tough set to complete in any kind of decent shape. The cards were printed on the back of Royal dessert boxes, and took up nearly the entire surface, thus the problem cutting them out with wide borders. They were issued over a span of three years, starting in 1950. A total of 24 players were pictured in either a black and white, or blue and white (see below) dutone photo. Short player bios and performance stats accompany the photos. 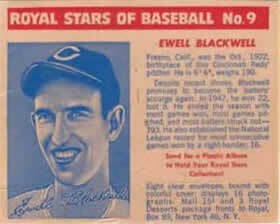 Updates, during 1951 and 1952, to some player's sats increased the possible number of variations to a total of 47 cards. For example, card #14, Ray Scarborough, has four different variations: he appears as a member of the Senators, two different versions with the White Sox, and finally as a member of the Red Sox. 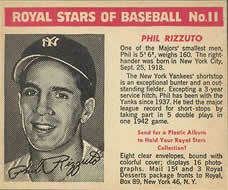 The cards normally have blank backs which tend to magnify any creases or defects the card may have. Cards with promotional messages printed on the backs are also found. These cards are worth twice as much as a blank-backed card. An offer for a comb-bound album, with 8 pages for 16 cards for 15¢ and 3 Royal Desserts package fronts is found on the front of each card. The American Card Catalog number for these cards is F219-1. The cards, if they are to receive a grade from a third party, should be at least 2 5/8" x 3 1/4". Cards that are smaller, only get a grade of "Authentic". 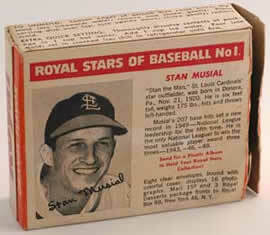 The SCD Standard Catalog of Baseball Cards lists their size as 2 1/2" x 3 1/2". In my opinion, these measurements are in error. The width is too long and the height is too short to make a gradeable card. The Old Cardboard Web site has just changed it's measurement for these cards to agree with my conclusions. They were prompted to do so after I sent an e-mail to Don Fluckinger, the editor of the SCD Standard Catalog. These are the cards that I currently have. They may be seen on the SGC Registry web site by clicking here. A complete checklist, in .pdf format, may be seen by clicking here. 2nd paragraph begins "Pee Wee's..."
2nd paragraph ends "...when pitching." 2nd paragraph begins "In 1949..."
2nd paragraph ends "...one 1942 game." b and c varieties with White Sox; d with Red Sox. 2nd paragraph ends "...service record." 2nd paragraph ends "...in military service."